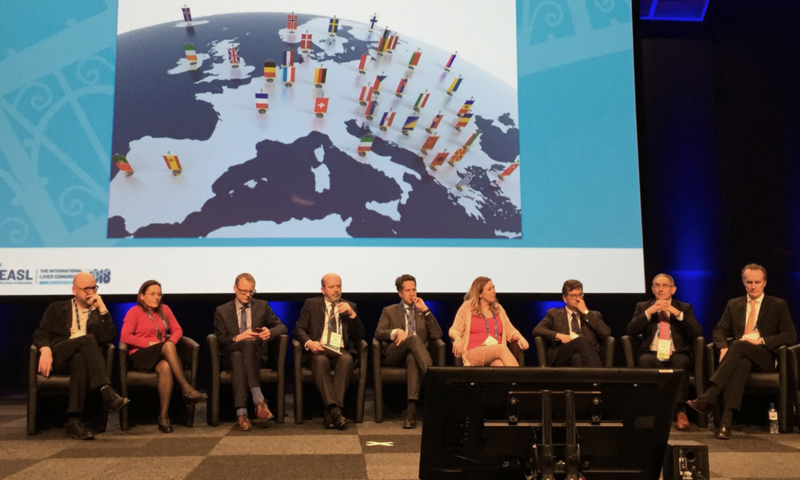 The EASL hepatitis C treatment guidelines panel at The International Liver Congress, 2018. Photo by Liz Highleyman. The European Association for the Study of the Liver (EASL) released its latest hepatitis C treatment recommendations at the 2018 International Liver Congress this month in Paris. The guidelines are available online in the Journal of Hepatology. The recommendations – which are intended to apply to all European countries – include the most recently approved hepatitis C virus (HCV) therapies, with the acknowledgement that older options may still be used where newer ones are unavailable. The guidelines simplify treatment by doing away with HCV genotype testing and even post-treatment assessment of long-term virological response in many cases. As in the previous guidelines, EASL recommends treatment for everyone living with hepatitis C, including those who were not cured or who became reinfected after a first treatment attempt. "Everyone infected has a right to be treated, and if treatment fails, has a right be to be treated again," Jean-Michel Pawlotsky of University of Paris-Est, who co-ordinated the expert panel that developed the guidelines, said during a special session at the conference. Nevertheless, some people should be treated without delay, including those with significant liver fibrosis or cirrhosis, extrahepatic manifestations, HCV recurrence after a liver transplant, people at risk of rapid disease progression and those at risk of transmitting HCV such as people who inject drugs, gay and bisexual men with high-risk sexual practices, prisoners and women who wish to become pregnant. The goals of treatment are broad. In addition to preventing complications of HCV-related liver disease – such as cirrhosis, liver cancer, decompensated liver failure and death – they also include improving quality of life, removing stigma and preventing onward HCV transmission. With regard to pre-treatment assessment, the panel recommends reflex testing, meaning a single blood sample is used for initial HCV antibody testing and confirmatory HCV RNA testing. This removes a barrier to care, as many people who test HCV antibody positive are lost to follow-up and never receive a HCV viral load test to determine if they need treatment. "This will definitely increase access to care," Prof Pawlotsky said. "You don't need to bring the patients back." The panel now recommends only interferon-free, ribavirin-free direct-acting antiviral (DAA) regimens for people with or without compensated cirrhosis; those who were not previously treated and those who were treated with interferon-based regimens or sofosbuvir (Sovaldi) plus ribavirin; and people with or without HIV co-infection. EASL previously released updated hepatitis C guidelines at a special meeting in Paris in September 2016, soon after the European approval of Merck's grazoprevir/elbasvir (Zepatier) and Gilead Sciences' sofosbuvir/velpatasvir (Epclusa). Since that time, the European Medicines Agency has approved AbbVie's glecaprevir/pibrentasvir (Maviret or Mavyret) and Gilead's sofosbuvir/velpatasvir/voxilaprevir (Vosevi), two highly effective pangenotypic regimens. The panel recommends sofosbuvir/velpatasvir or glecaprevir/pibrentasvir for people with HCV genotypes 1a, 1b, 2, 3, 4, 5 and 6. Sofosbuvir/velpatasvir/voxilaprevir is also included for those with genotype 3. The recommended treatment duration is 12 weeks of sofosbuvir/velpatasvir and 8 or 12 weeks of glecaprevir/pibrentasvir for people with and without cirrhosis, respectively. Because these all-in-one regimens work equally well against all genotypes of HCV, genotypic testing prior to treatment is no longer necessary, which reduces cost and removes another barrier to access, especially in resource-limited settings. Routine pre-treatment drug resistance testing is also not necessary. And because these regimens are so highly effective – with cure rates approaching 100% for most people – the panel says that if viral load is undetectable at the end of therapy, post-treatment assessment of sustained virological response (SVR) is "dispensible." "We don’t really need SVR if we have a 99% cure rate," Pawlotsky explained. "Tell patients to be adherent and the vast majority will be cured—but we won't know if they're cured. This makes it simpler." The panel also included some older genotype-specific regimens, which may be more readily available and less expensive in some countries. They added that generic drugs may be used if quality control can be assured. Prof Pawlotsky noted that the combination of sofosbuvir plus daclatasvir (Daklinza) was omitted because of the high cost of using two drugs from different companies, but this would not apply in the case of generic versions. Sofosbuvir/ledipasvir (Harvoni) is recommended for genotypes 1 a, 1b, 4, 5 and 6, while grazoprevir/elbasvir is recommended for 1a, 1b and 4. AbbVie's old ombitasvir/paritaprevir/ritonavir/ dasabuvir (Viekirax/Exviera) regimen is appropriate only for easy-to-treat genotype 1b. The panel said that people with acute HCV infection should be treated for 8 weeks using the same pangenotypic or genotype-specific regimens recommended for those with chronic hepatitis C. SVR should be assessed at both 12 and 24 weeks, as late relapses have been reported. For people who were previously not cured with combination DAA therapy, the panel recommends sofosbuvir/velpatasvir/voxilaprevir for 12 weeks, glecaprevir/pibrentasvir plus sofosbuvir for 12 weeks in people with predictors of poor response, or one of these combinations with added ribavirin or extended to 16 or 24 weeks for the most difficult-to-treat people, including those with NS5A resistance mutations who were not cured with two prior treatment attempts. The panel added a recommendation of sofosbuvir/ledipasvir for adolescents over age 12 with HCV genotypes 1, 2, 5 or 6. Those with genotypes 2 or 3 can be treated cautiously with other regimens approved for adults, given the lack of data for this age group. Children under 12 should hold off on treatment until pangenotypic regimens are approved for them, according to the panel. People who use drugs should be considered eligible for treatment – and in fact are a priority if they are at risk of transmitting the virus. "Keep it simple," said panel member Olav Dalgard of Akershus University Hospital in Norway. "You don't need to build up a big support network for people who inject drugs. You can usually treat them like others. We don't want to erect more barriers." For people with decompensated cirrhosis, the panel recommends sofosbuvir/ledipasvir or sofosbuvir/velpatasvir with ribavirin for 12 weeks, or without ribavirin for 24 weeks for those who cannot tolerate it. Glecaprevir/pibrentasvir and sofosbuvir/velpatasvir/voxilaprevir are not recommended because people with decompensated liver disease should not use HCV protease inhibitors. Based on the latest data, the panel was able to offer more insight on when to treat people awaiting a liver transplant. Some patients and providers have expressed concern that treatment could improve liver function enough to make people ineligible for a transplant, but not enough to give them a good quality of life. The panel now recommends that people with a MELD score below 18-20 should be treated for hepatitis C before transplantation, while those with a score of 18-20 or higher should receive a transplant first, without antiviral treatment, and be treated for HCV afterwards. However, the latter group can go ahead with treatment if the transplant waiting time is expected to exceed 6 months. For people with HCV recurrence after transplantation, treatment should be started within 3 months using regimens similar to those used for non-transplant patients. Now that treatment for hepatitis C is so successful, organs from HCV-positive people can be used for transplantation for either HCV-positive or HCV-negative recipients with informed consent and if post-transplant DAA therapy is guaranteed. Successful hepatitis C treatment slows or halts liver disease progression and lowers the risk of hepatocellular carcinoma (HCC), a type of primary liver cancer. Most experts now agree that an earlier suggestion of a higher risk of HCC recurrence among people cured with DAAs was due to the treatment of sicker people after these drugs became available. Nonetheless, while the risk of liver cancer is reduced after treatment, it is not eliminated, especially in people with cirrhosis. These people should undergo regular HCC surveillance in areas where HCC treatment is available. Geoffrey Dusheiko of University College London suggested that people with advanced (stage F3) fibrosis, those with metabolic syndrome (who are at risk for fatty liver disease) and those with other risk factors should be under surveillance for HCC as well. Pawlotsky JM et al (European Association for the Study of the Liver). EASL recommendations on treatment of hepatitis C 2018. Journal of Hepatology, in press, 2018.